I'm offering a 3-day intensive training to teach past life regression therapy. This training is open only to practicing therapists, hypnotherapists, counselors, and health care professionals who intend to use past life therapy with their clients. I teach the past life therapy methods I've learned from pioneers in the field and perfected over the last 30 years. 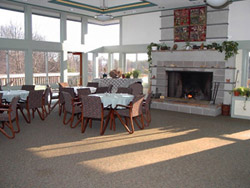 The location is beautiful and secluded Temenos Retreat Center near West Chester, PA, 19382 a 55 minute drive from the Philadelphia International Airport. The 2019 training is full. Please check back to this site soon, because I will be posting the date and cost of the 2020 training. This is intense, personalized, hands-on training. Enrollment is limited to 14 people. I will demonstrate at least two regression sessions with participants. I will teach you the steps of past life therapy: finding the client's core patterns, induction techniques for accessing past life memories by using an affect bridge, how to guide the session, and how to help a client integrate the past life material and relate it to their present life. You will receive a manual, written by me (unpublished and unavailable anywhere else), which covers the basics of past life therapy and is the outline for the training. My approach has evolved over the years, as I trained in many different styles of regression therapy, with the pioneers in the field. After trying many different techniques that I've learned, I've found that using an affect bridge--having a client focus on present-life core feelings and thoughts--is a direct line into a relevant past life experience, and can be a source of healing and understanding. Because it is a small class, there will be an opportunity for you to practice these techniques with a participant, and for you to be regressed by a participant, with some supervision by me and an experienced assistant. There will be ample time for questions and discussion after the practice sessions. Scroll down to read the testimonials from participants in other trainings. The training begins at 9:00 each day, and finishes by 5:00, and by 4:30 on Sunday. Evenings are free for dinner in nearby West Chester. Commuters are welcome! Temenos is situated on 56 wooded acres in historic Chester County, an hour west of Philadelphia, PA. www.temenoscommunity.org We have access to the entire main building--which includes the great room where the training takes place, and guest bedrooms, which will also be used for the practice sessions. There are a limited number of double and single rooms available at Temenos. The price for a single room is $110/night; a double is $70/night each. Breakfast is included in the price of the room. These rooms are available for two nights only--Friday and Saturday. If you don't stay at Temenos, there are hotels and Bed & Breakfasts in the West Chester area, within a short drive to Temenos. Chester County is beautiful, with rolling hills, woodlands, horse farms, and homesteads and villages from the 19th and 18th centuries. It's a short drive to world-famous Longwood Gardens, hiking, and canoeing on the Brandywine River. The Brandywine Battlefield (1777) is a few miles away too. Consider arriving early, or staying a few extra days to explore the area. To register for the training, or if you have any questions, please email me at Carol@carolbowman.com, or call me at 610-566-3870. I must talk to you before accepting you into the training. This training is only for therapists. At the time of registration, a $200 non-refundable deposit is required to hold a place for you. The balance is due on April 1st. There will be no refunds on the balance of the training fee and the accommodations fee after April 1st. Accommodations to stay at Temenos are made through me, not the Retreat Center. I am taking reservations now. After I've talked to you, please send your checks made out to 'Carol Bowman' to: 145 Latches Lane, Media, PA 19063. I've compiled a list of books I highly recommend for everybody who plans to train with me. There is only one required reading in preparation for the class: a few chapters in Mark Wolynn's book, which you'll find on the list, on finding the "core language." We will be using a "core language" approach in accessing past life memories in the training. If you aren't doing the training, but want to read about past life therapy, you'll find these books helpful. Click here to go to the list of books. Click on the images on that page and you can buy the books on Amazon.com. I would like to thank Carol for an incredible training. I am an alternative therapist and I try to grow my work a little more every year in depth and understanding in what I bring to my clients and my own healing. But I must say this training was like pushing a fast forward button. The intimacy of the small group, the beautiful energy of the setting at Temenos, and especially Carol’s generous and compassionate nature, provided me with just what I need as a therapist. It was the hands-on experience that allowed for true integration. We were able to watch Carol work, and then to practice these techniques on each other in a safe environment and under her personal guidance. What I came away with are specific techniques, invaluable tools—things that can’t be found in any book. And she continues to provide support even after the training has ended. Thank you again, Carol. I look forward to attending another training with you soon! I want to thank you for finally teaching a PLRT training class! I have always been a fan of your technique and was thrilled to have the opportunity to study with you.I attended the program with expectations of learning how to assist others with healing of issues/patterns that could be stemming from a past life experience. The program lived up to every expectation! Additionally, I left the training feeling quite healed myself. I certainly got my money’s worth! Over the last thirty years I've spoken and given workshops and trainings in all parts of the United States, Europe and South America. I speak about past life regression therapy with adults as well as children's past life memories. Most importantly, I show the vital connection between children's spontaneous memories and the healing power of adults’ past life recall. Once a year I hold an intensive workshop to teach therapists the art of past life regression. If you would like me to give a talk or do a workshop for your group, please contact me. I do charge speaker fees. Fees are very reasonable if the talk is within an hour’s drive of Media, PA, (most of the greater Philadelphia area). Or we can make arrangements for traveling to your community or country.